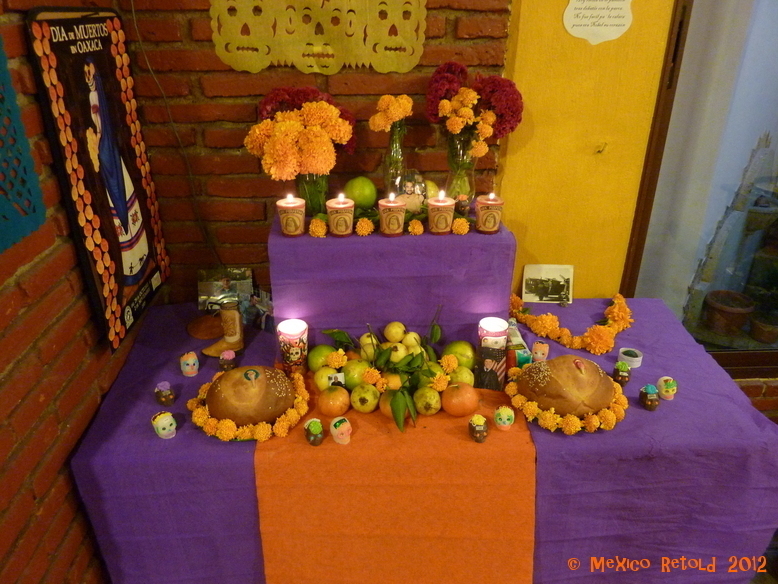 Making an altar for Day of the Dead is very easy and the process is really fun! It also gives you time to reflect on your loved ones that you have lost and think about the things they liked. Making an altar shouldn’t just be for those of us lucky enough to be here in Mexico, it is really something that can be enjoyed by everyone. Therefore, I have put together this very simple step by step guide to help you make an altar, wherever you are in the world. But remember, there are lots of different ways to make an altar, and any number of different designs, so this is by no means a definitive guide! 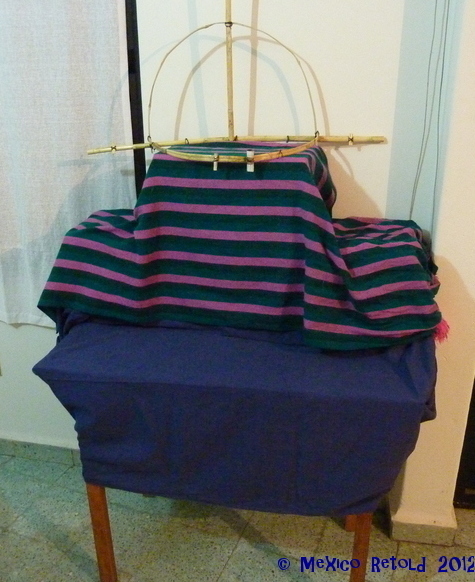 To start the altar, you will need a table and a box or two to place on top. The boxes will create a raised platform, giving your altar more height and presence. It also allows for more surface space to place your offerings. Once you have arranged these as desired, I would suggest covering the platform and the table with a sheet, preferably something brightly coloured. You may also want add another layer as we did here to add interest. Next we added the used frame of a firework (a very Oaxaca thing) to make an arch but you could make this arch easily out of a piece of dowling and a thin piece of ply wood or from a piece of bent metal (perhaps the handle of a bucket) fixed into a base of two plant pots using plastecine or green floral foam that you can get from any florist. 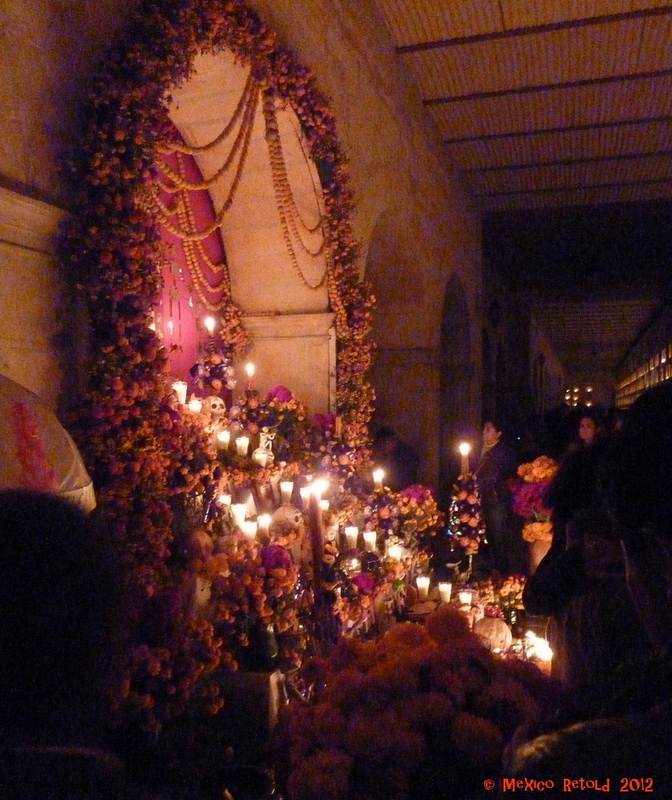 It is also perfectly fine not to have an arch on your altar as you will see in the pictures of other altars below. If you decide to have an arch however, the next step is to tie flowers to it. 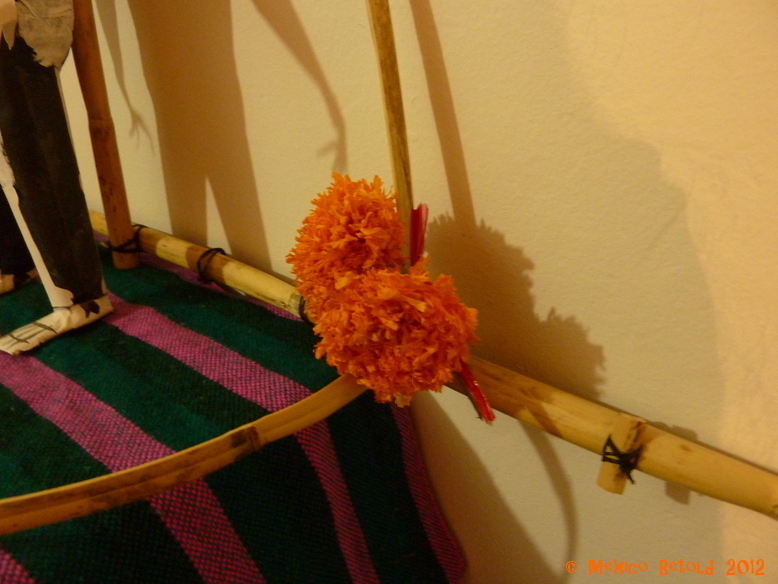 We used traditional Flor de Cempazuchitl, which is technically equivalent to a Marigold. Tie two flowers (cut with about 3 inches of stem) together with string and tie them to the arch until the arch is covered. 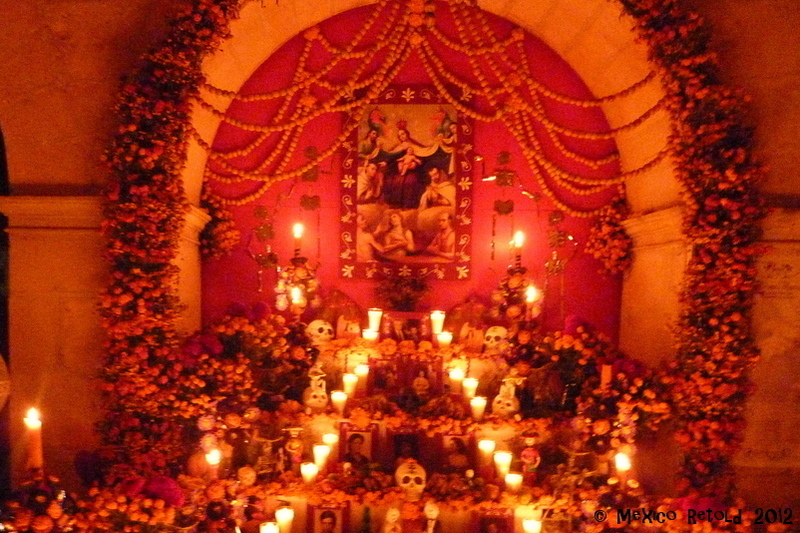 Then add more flowers, candles and bread and fruit to the altar. You may also want to add skulls, which can be made from sugar or chocolate if you have a mould, or you could also make skulls or skeletons from papier maché. There is also the option to add papel picado (crepe paper cut with intricate designs) if it is available where you are. Remember there are no rules so you can do whatever feels good to you! 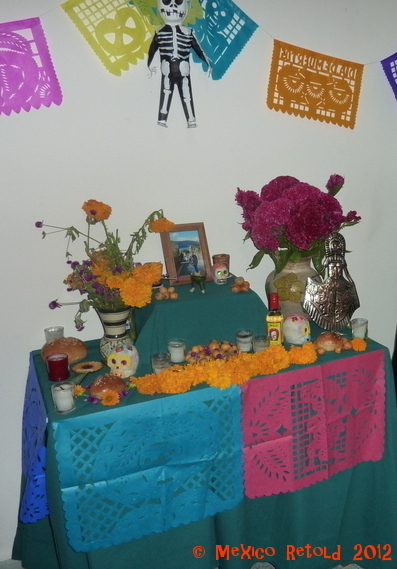 Once the altar is complete you can add photos or trinkets related to your deceased loved ones. You can also place their favourite tipple or food, or perhaps a cigarette or two or their favourite perfume etc on the altar. All these things are believed to entice them back to enjoy the earth again for a day. I have been known to make sandwiches and cups of tea, and to leave cut up chocolate bars on my altars in the past. 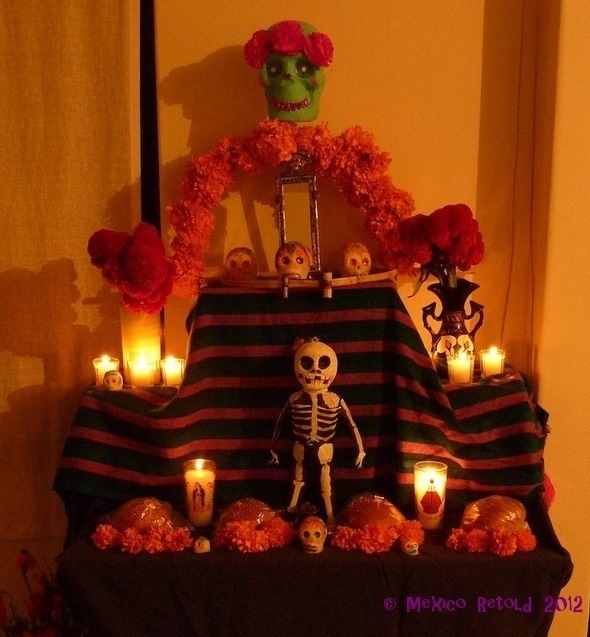 As I mentioned, there aren’t really any set rules about how your altar should look. Below are just a few examples of different altars I have seen or made! I hope you enjoy the process as much as I do and I would love to see any pictures that you would care to share! Thanks! Please share pics of your altar if you make one! 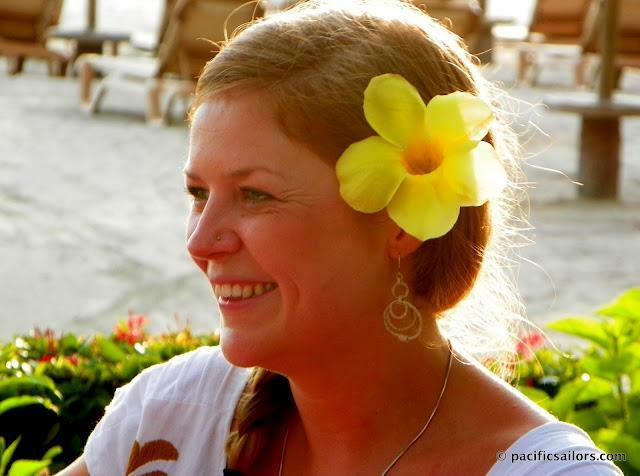 Thank you for the inspiration and posting this beautiful song Susannah! No problems Karen. I am glad it was inspiring to you! I can’t wait to make my altar this year!